COROZAL TOWN—A Belize Sugar Industry barge carrying about 120 to 125 tons of sugar from Orange Walk Tower Hill Sugar Factory to Belize City sank in the area of Cerros in front of Corozal Town, and its cargo of sugar was lost. 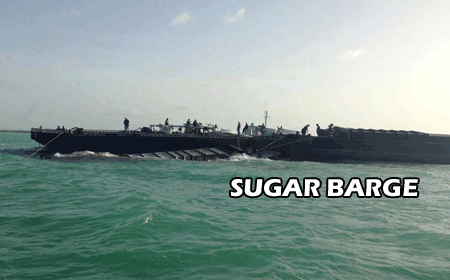 BSI authorities said that the barge carrying the sugar began to leak, which caused a rupture, causing it to go under. The incident occurred at about 7:00 Sunday evening between Sarteneja and Warrie Bight, but the operators were able to bring it to Cerros, where the barge went down completely, with its cargo of sugar. The cause of the leak is yet unknown, until the barge is recovered from the sea and taken to a dry dock, where it will be examined.